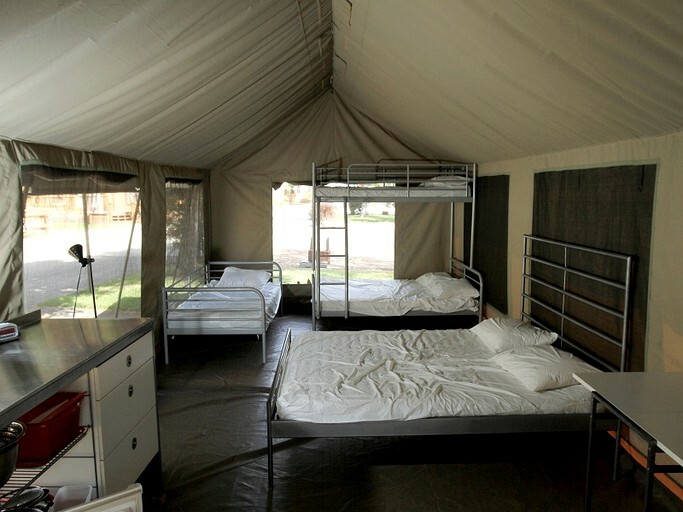 This deluxe, African safari-inspired tent has comfortable beds that can sleep up to four to six guests. Inside, there is a microwave, a coffeemaker, and a fridge. There is a double-size bed, a single-size bed, and a set of bunk beds. Electricity is provided. 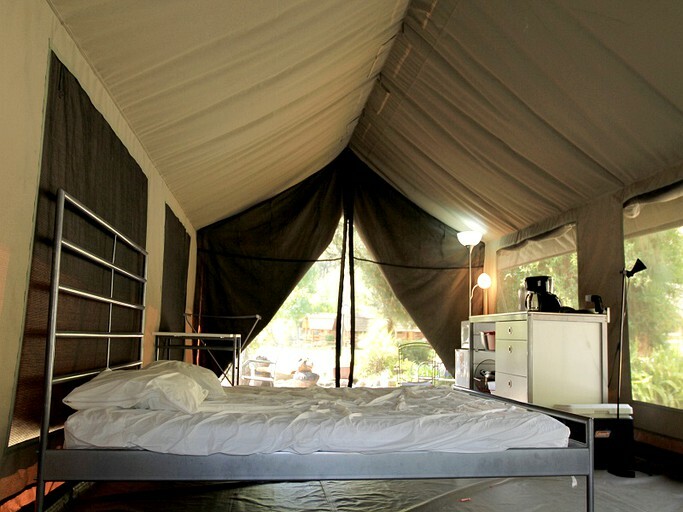 This glamping property has a main lodge with Wi-Fi access. Guests can access cable TV and a game room, as well as a meeting room with a kitchen directly on the property. 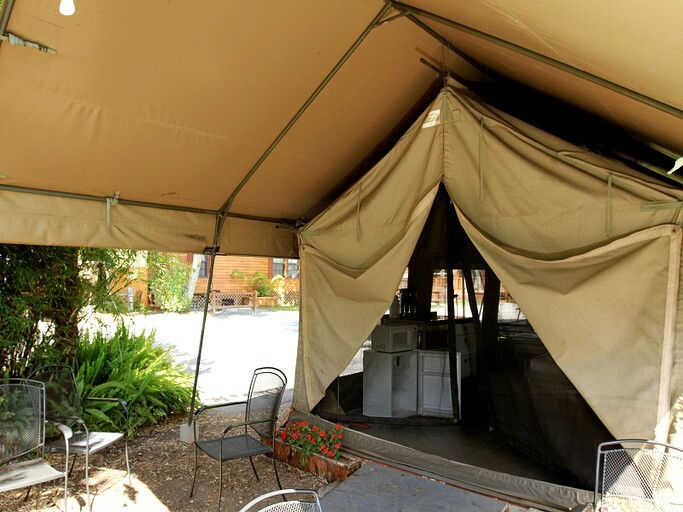 A two-acre grass field is available for events, and there is a campfire area for daily use. 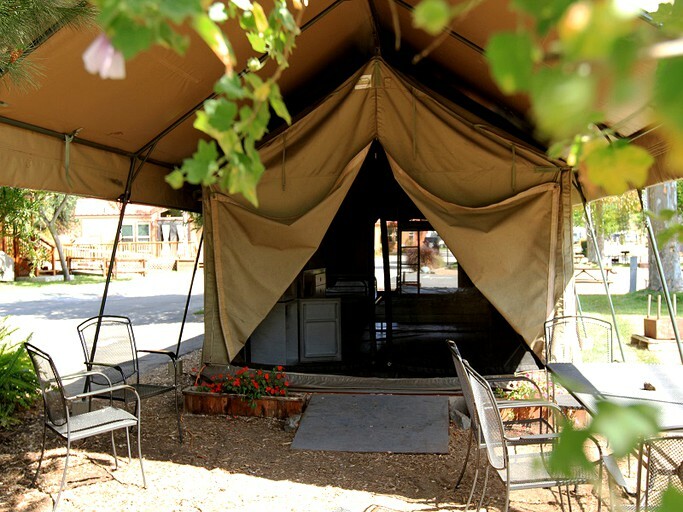 Both children and adults alike will find it hard to get bored at this glamping site. There is an activities director to organize frequent special events and arts and craft projects. Otherwise, enjoy the on-site activities like basketball, rock climbing, and horseshoes. There is a designated game room equipped with a pool table, ping pong, internet kiosks, and video games. Toddlers will delight in lollipop hunts, bubble-blowing time, and wagon hay rides. All ages will enjoy ice cream parties and movies under the stars, complete with popcorn and hot chocolate. Children can run loose on the playground, and adults can join them in the swimming pool. 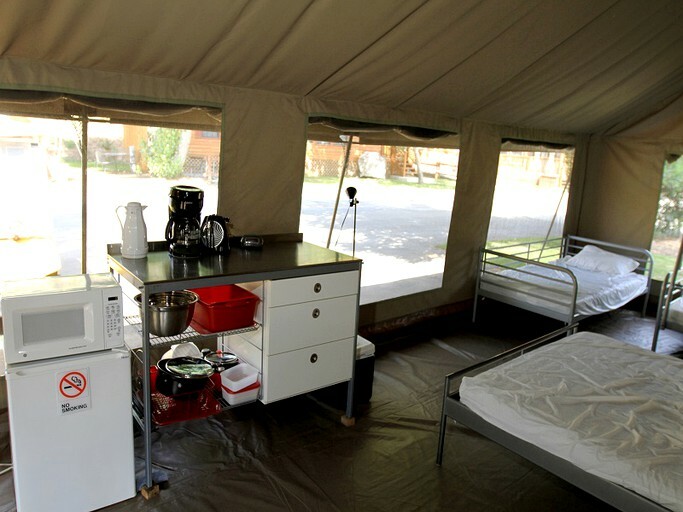 Learn to cook delicious camping recipes through live cooking demonstrations, practice yoga, or participate in a fitness class. End each day spending quality family time around the campfire with smores. There is a three-night minimum stay over some holiday weekends. Rates vary during holidays. Check-in is at 1:00 p.m. Check-out is at 12:00 p.m.
Check-in: 3:00 p.m. Check-out is at 11:00 a.m.